Sweet crunchy corn, tangy cream cheese, and spicy tomatoes brought together in a tasty appetizer recipe that is ready in about 10 minutes! 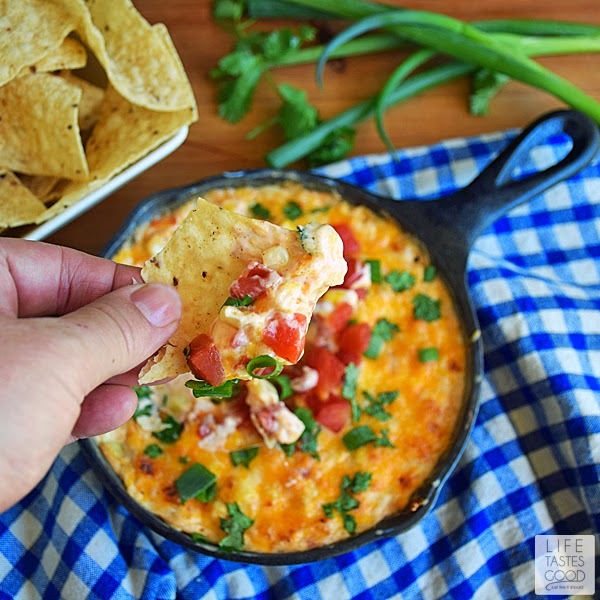 This delicious Hot Corn Dip is made in a skillet to quickly heat all of the ingredients so you can have this on the table in no time! 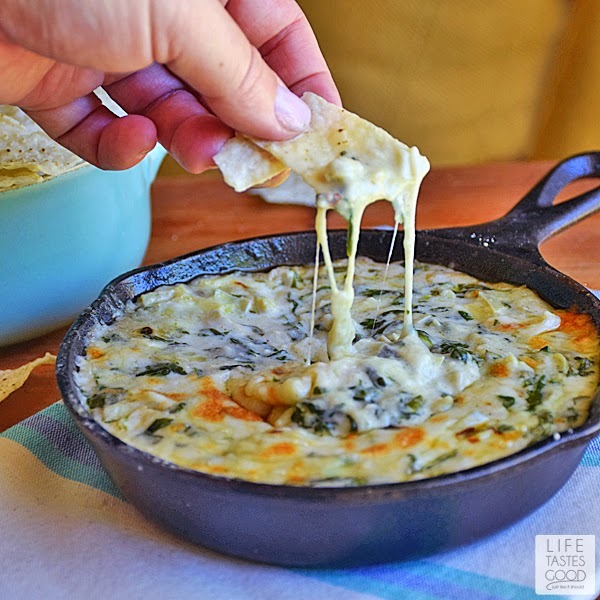 I love to make dips in a skillet, because it is so quick and easy to do. 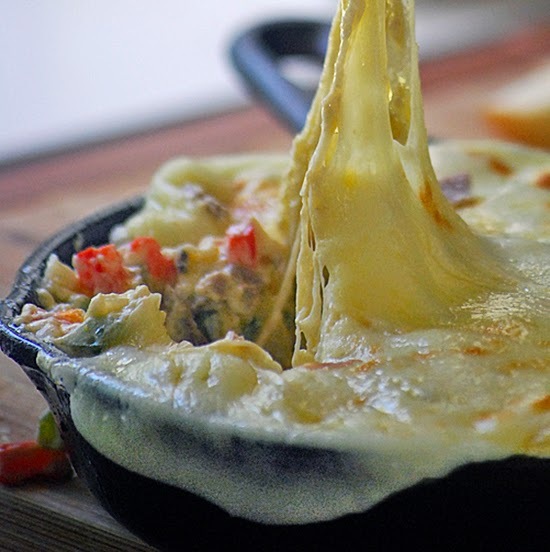 By heating all of the different ingredients in the skillet you can whip up a delicious appetizer dip in no time, and it makes a nice presentation serving right in the skillet! I love that! No unnecessary dirty dishes to clean up! What a great bonus! 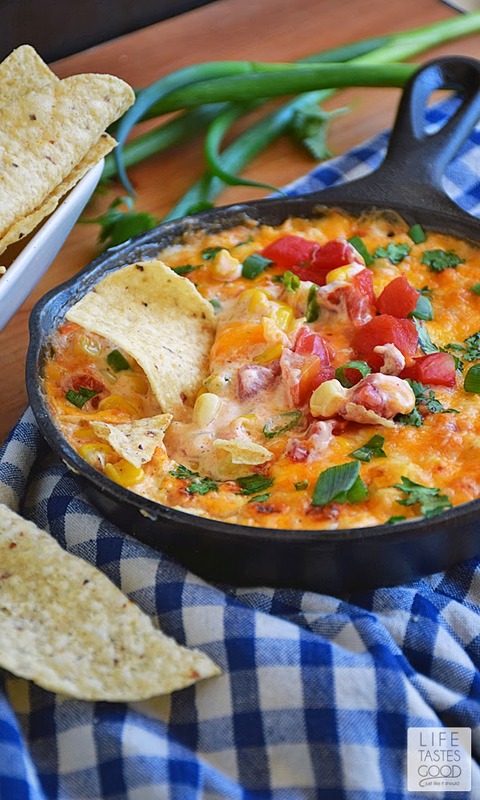 This Hot Corn Dip is sweet, tangy, and a little bit spicy all at the same time! It's creamy but also has a crunch from the corn, making the texture every bit as satisfying as the wonderful flavors. I wasn't sure how this would be with corn tortilla chips, but I had some on hand, so I decided to give it a try and you know what? It's awesome! 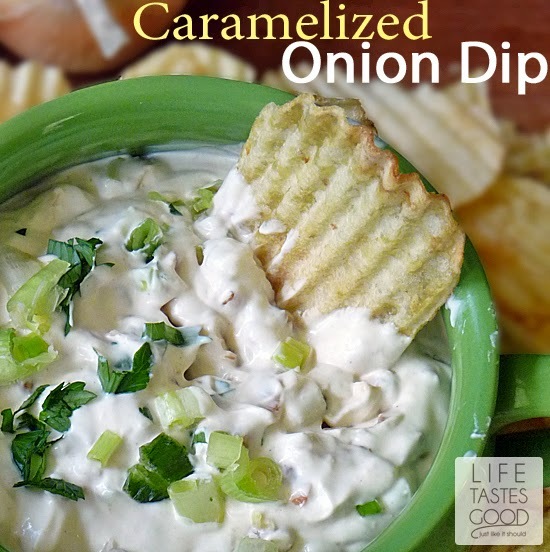 The corn chips are the perfect compliment to this tasty dip! 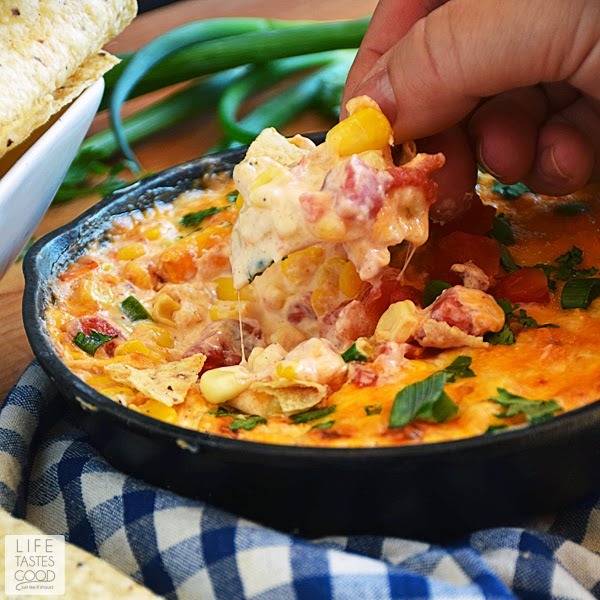 Each crispy bite explodes with flavor, and, even though it's called a Hot Corn Dip, it's tastes good cold too! I topped this dip with some shredded cheddar cheese, and freshly chopped cilantro and green onions. Cheese because, well it's cheese and you can't have too much cheese in an appetizer dip. Am I right? Of course I am! The cilantro and green onions added a little color, but it also added tons of delicious flavor. It is the perfect garnish for this Mexican inspired dip. Because she attends college out of state, we won't have family or friends attending her graduation, but we have been talking about having a small get together. 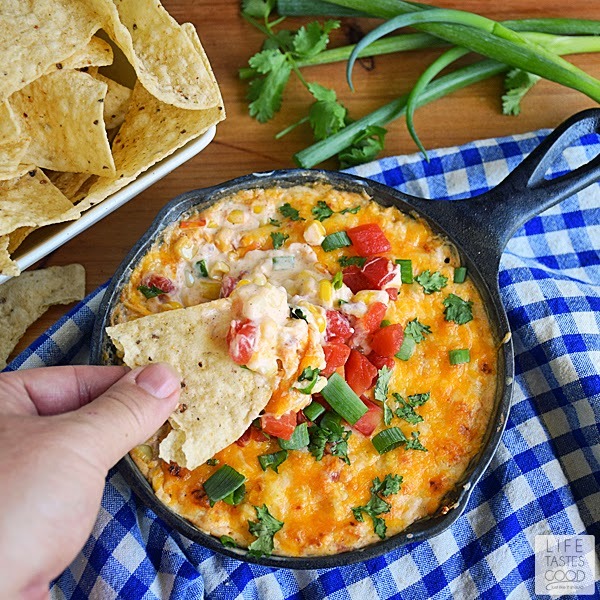 Just in case the stars align and we are able to make it happen, I wanted to start trying out some new appetizer recipes like this Hot Corn Dip. Madison loves Mexican food, so I think this one would be a hit with her! I'll be sharing more party recipes over the coming weeks, so be on the lookout! Heat a small cast iron skillet over medium heat and add the corn. Cook, stirring, until heated through. Add 1/2 can of the tomatoes with green chilies, drained and 4 ounces of cream cheese cut into small pieces. Stir to melt the cheese and combine all the ingredients. Once the cheese is melted and all of the ingredients are combined into creamy goodness, add 1/4 teaspoon chili powder, 1/4 teaspoon garlic powder, and a pinch of salt. Stir to combine and give it a taste. Adjust the seasonings as needed. Top with 1/2 cup shredded cheddar cheese and place under the broiler for about 1 minute until the cheese starts to brown. Keep an eye on it!! It will burn quickly and that would be sad. Garnish with about a tablespoon of the tomatoes, freshly chopped cilantro, and chopped green onions. Serve with corn tortilla chips and enjoy! I think I'll have to make this in a large skillet or else my hubby will eat it all by himself! this looks delicious! HA! Mine told me next time I have to double it ;) Thanks, Sara! Marion this is a must make for me. I have to think about where I can take it...and it could very well be the family reunion! Looks delicious! I hope you love it like we do, Shelby! Thanks!! I'm drooling over this dip. I'm going to have to make it. It's so easy and delish! 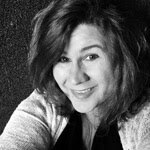 Let me know what you think, Michele! Thanks!! 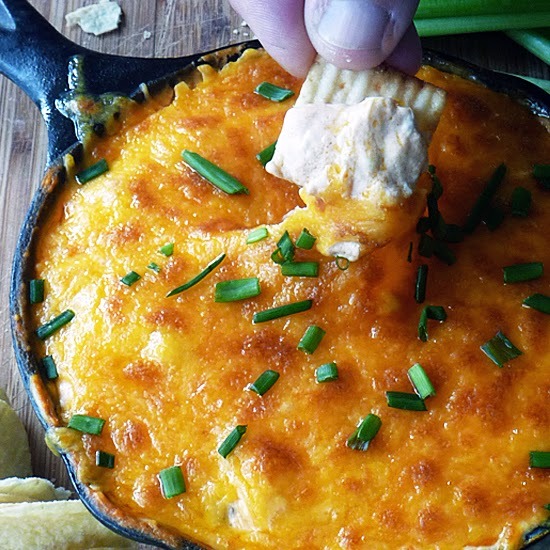 Ooey, gooey, cheesy dips are my down fall. I could eat the entire skillet! Me too, Christie!! Can't go wrong with ooey gooey cheesy anything ;) Thanks!! this just looks SO tasty! 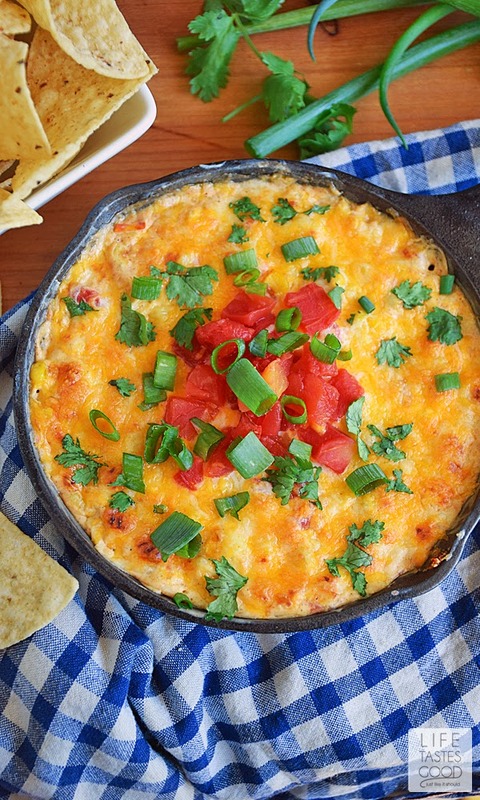 Love this dip and I LOVE Rotel, so I'll definitely be trying this one.